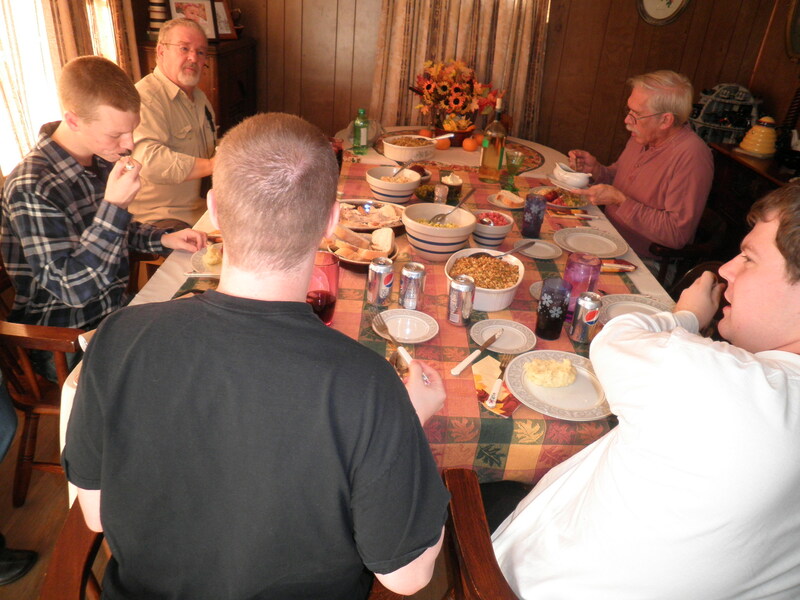 This time last week most of us were getting ready for Thanksgiving. I can’t believe that a week has really slipped by me since then. It doesn’t feel like a week. Maybe because there were three additional days of eating Thanksgiving leftovers! There are still some in the fridge, but they’re all turkey related so those are for Ralph. But here I am again, ready to be part of Thinking Out Loud hostessed by Amanda at Running With Spoons. I’m not really sure what’s on my mind, but that never stops me, does it?!? ~This has not been my favorite week. There’s been a lot of rain, which never makes me happy. I’m much sunnier when the weather is sunnier. It’s one of the reasons why I need to NOT be in New Jersey, but that’s a topic for another day. The next couple of days are expected to be dry, if not sunny. I can deal with that. Just no rain please. I try hard to work around it, but the weather can have very negative effects on me. I suppose I should be grateful…my life is so much better than last year this time. Ok…I’ll stop complaining. ~Some household issues have been a huge pain. They are ongoing and unresolved as I write this. Everything is falling apart. Gotta love living in a Very old house. Things will work out eventually but for now they’re making me very cranky. ~I’m trying to get some Christmas spirit, but every time I take a step forward I seem to go back by one. Little things like buying a present for someone and then finding out the person already has it. Ugh!! Have to put my thinking cap back on. I’m just not good at this anymore. I’ll get there though. I keep trying and I guess that’s what matters. ~One thing that Is making me happy and feel good right now is exercise. I mentioned a few weeks ago that I joined the gym. I’m loving the whole process. I go with my two best friends most days but I will even go when they can’t go or if our schedules conflict. I’ve been there three times this week and I think we’ll be going today. I even thought about going on Thanksgiving morning but changed my mind. The surprising thing is…I thought about it!! I also found out about something called #mileaday from my friend Kristen at ok,enjoy. She got it from another blogger. The idea is that starting on Thanksgiving and throughout the Holidays, try to log one mile a day. As she says in her post, it’s not a lot but it’s a start. I think for so many of us we have No Idea how much activity we get or don’t get. This is a start and for those of us who tend to over indulge during the Holidays and then say they need to start doing something after January 1, you’ll already be started. I don’t use any of those fancy fitness trackers…well not at the moment anyway. I am thinking about one. 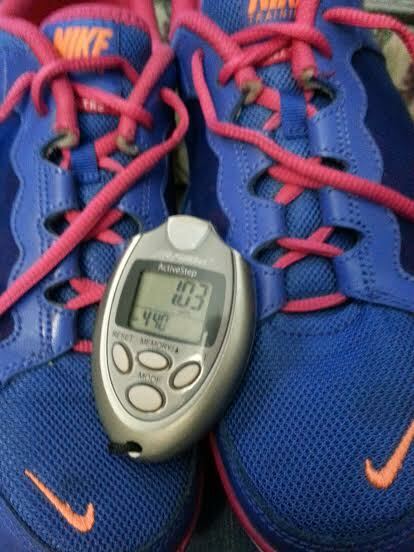 For now I just use my plain old pedometer and it works well. It tracks my steps both regular and aerobic and gives me the mileage. I’ve tracked a mile everyday even on my non-gym days so that makes me happy. Some days I’ve had to resort to marching in place while watching TV but that’s ok, I still get it in. I think that anything that makes you aware of what you’re doing or not doing is a good thing. Besides, it’s fun and I have to keep thinking to find fun ways to post it on Instagram. I can’t just always show my sneakers! There you have Thinking Out Loud this week. I started out a little cranky and grumbley but I turned it around. Be sure to check out Running With Spoons to see what everyone has on their minds. Can’t believe it’s Wednesday already and time for What I Ate Wednesday, the fun and drool worthy link up hostessed by Jenn at Peas and Crayons. But it is and here I am again going on and on about what I ate. I love to see what everyone has been eating, especially after a Holiday. Here’s my contribution! Of course it was Thanksgiving. So many people dread this Holiday, it seems. Probably because more than any other Holiday, it revolves around food. 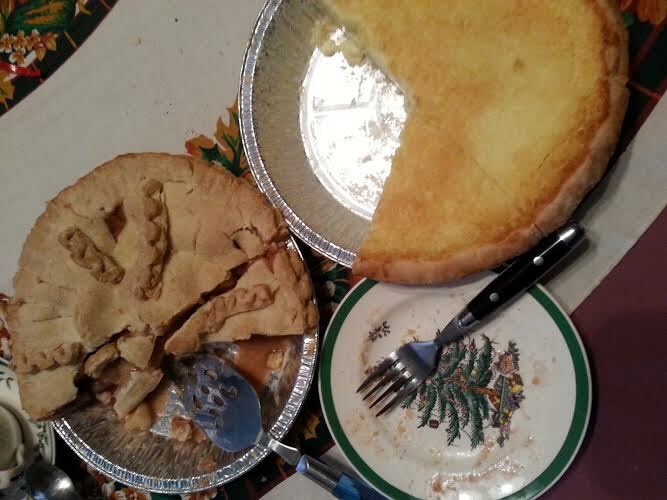 Other members at my Weight Watchers meeting on Saturday were so worried about how to approach it. That’s actually always seems to be the topic at WW on the week before Thanksgiving: How To Cope With Thanksgiving. 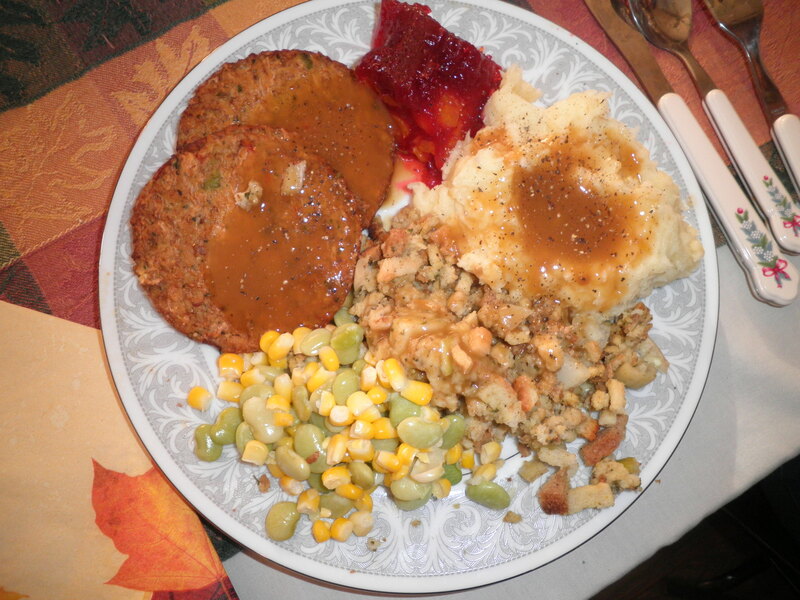 Believe me, I’ve been through many Thanksgivings where I was over the top, over indulged and over stuffed. I know it’s an issue for a lot of people. I felt in control and on track this year and I was proud of myself. I started with a regular breakfast of an egg substitute omelette which always keeps me full for a while. Dinner was planned for 1 pm so I knew I’d be Ok until then. My sister Ele and I always work on the dinner together and we had a really good time. 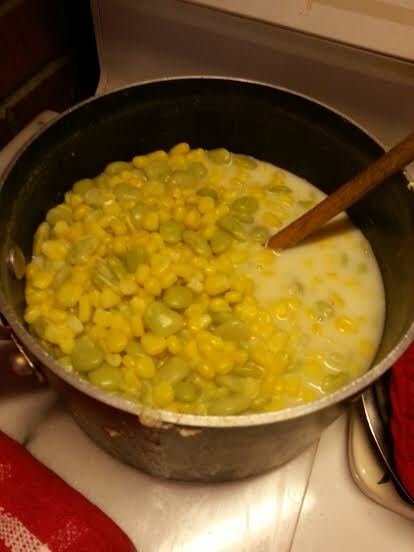 One of my jobs is making the succotash. It’s not something that everyone likes, but almost everyone in our group likes it. Personally, I LOVE it! I joked that this was mine and I didn’t know what anyone else would be eating. I probably could have eaten the entire thing if given the opportunity but I didn’t! 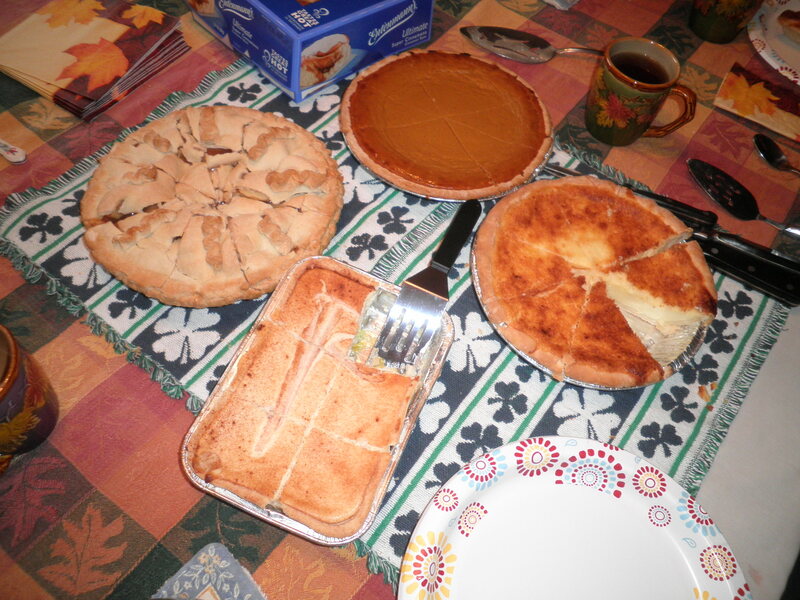 There were pies, yes, but I was restrained with them. I had a piece of the apple, home-made by our friend, Jim and just a tiny sliver of the coconut custard. Both were yummy. There was also a pumpkin but I passed on that…had to pass on Something! It was a great day and we had a lot of fun as we always do. That’s my Thanksgiving, now let’s go see what everyone else had on their favorites list. Be sure to check out Peas and Crayons to see what’s going on! First of all, Happy Thanksgiving to Everyone! I’m linking up with Thinking Out Loud again which has become my Thursday routine. TOL is sponsored by Amanda at Running With Spoons. If you have time today, stop over there to see what everyone else has on their minds. If not, just book mark it and go back tomorrow instead of spending all of your money on-line! I feel I’ve been grumbling a lot in my Thinking Out Loud posts, but today there’s none of that. This post is about thanks and gratitude. I have so many things this year for which I am thankful that I’m not sure where to start, so I may jump around a bit as things come to me. ~I am so very Thankful for the amazing gift and opportunity I was given this year. This time last year, I was not feeling very well. 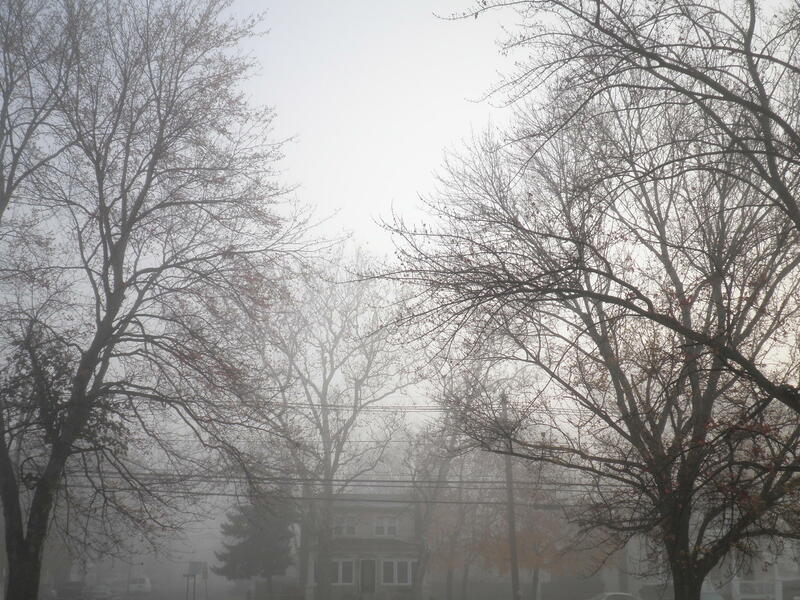 The cold and damp of the impending winter were starting make me feel the beginnings of the degenerative joint disease that got worse and worse through the winter and spring. As the winter progressed, so did my pain and discomfort. Finally in March, I could barely walk. I was so very lucky that I was able to find Dr. Richard Rothman at the Rothman Institute in Philadelphia. He changed my life by giving me two new titanium hips (yes I AM bionic!) and I will always be grateful. 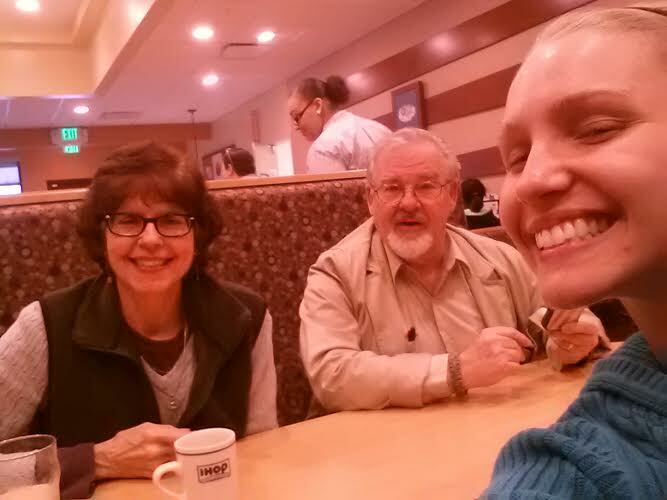 Besides, he told me I looked like I was in my 20’s…of course he was wearing glasses! ~I am so grateful to my best friend, Gail. Not only did she come back to New Jersey from her vacation in Maine to spend two weeks with me while I got on the road to recovery, but she opened her home to me for almost three months while she went back to Maine. Her house was more conducive to my recovery than mine was. She let me stay there and only laughed when I referred to myself as her “squatter.” She couldn’t be better. I’m so lucky to have her as my friend. ~I am so grateful to my sister, Ele. She visited me almost every day while I was there. She supported me and encouraged me and always made me feel I could get up and get back to normal. She was an especially welcome visitor when Ralph went West to his Army reunion and then on to New Mexico. She was great, but then she always is!! I’m so lucky to have the best sister in the world. ~Finally I want to say how lucky I am to have Ralph. He was admittedly a nervous wreck before during and after the surgery. He tried not to show it, but it’s hard for Ralph not to show his emotions. That’s one of the best things about him. He fed me (too much at times!) kept me company, worried about me, cared for me and encouraged me. He is wonderful and I’m so grateful that he came into my life. I wanted to share this picture of Ralph and Me. We don’t look Too Happy, do we?!? 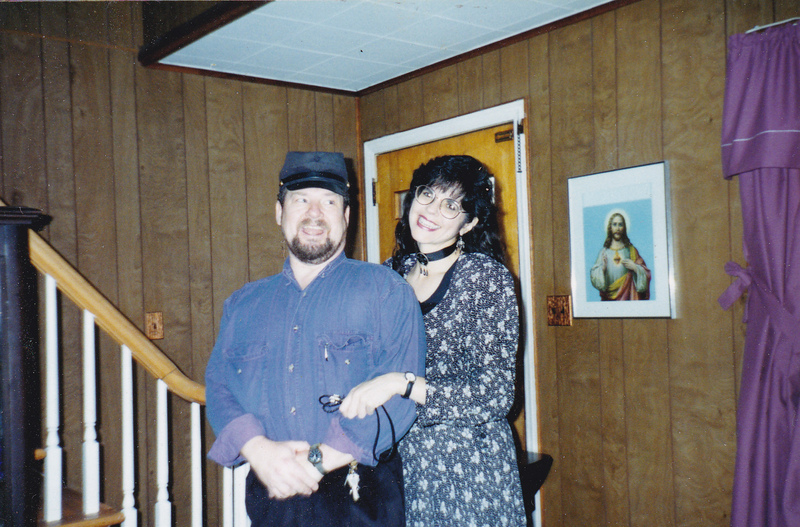 This was taken on Thanksgiving 1993. I don’t know this because I was smart enough to write it on the back of the photo. For some reason our family Never got that concept. We have tons of photos with nothing written on the back and we have NO idea who the people are. Most of the people who could identify the photos are gone. So Ele and I are left making up stories about who they are. I know when this was taken because we also have a video that my niece, Mary took on Thanksgiving 1993. In that video, you can see this photo being taken. It is the coolest thing to have something like that. It’s almost a little creepy, almost like it’s the paparazzi! It’s fairly long and Mary narrates the entire video. We lost her in 2007 so it’s wonderful to hear her voice and experience her sense of humor again. It is a gift and I’m thankful for that. ~My thankfulness is boundless today. I can’t show enough gratitude to these people who have made my life so full this year. So have just come into my life recently, others have always been there. There are many others, but this is long already. I’ve always been lucky. I don’t know if I’ve always been grateful or thankful enough. I am now. Be sure to stop over at Running With Spoons to read the other Thinking Out Loud posts. I bet you’ll find a lot of thanks and gratitude there, today. I can’t believe that I’m writing Thinking Out Loud #6!! Thinking Out Loud, hostessed by Amanda at Running With Spoons gives us all a chance to speak our minds and get things off our chests. I like it because I just like to babble on about things. Check out what the other bloggers are thinking about when you’re finished here. It seems like I just wrote my last Thinking Out Loud post. Time is flying and I’m starting to get those old pre-Holiday nerves. I have to keep my craziness under control. I think I can do it this year. It has gotten the better of me in previous years, but now that I’m feeling so much better, I’m feeling more positive about so many things. ~I am feeling so good and I’ve been doing my best to be active. 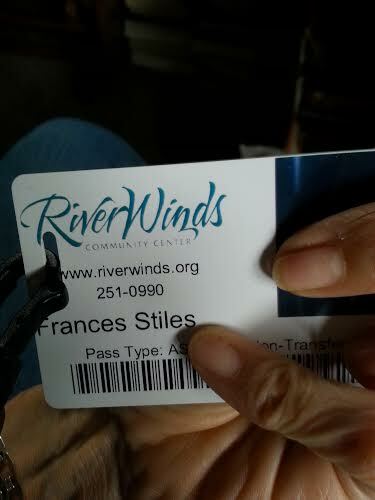 I had been going to the gym with my best friends Gail and Alice and using their guest passes. No longer! I am an Official Member!! I’m so excited. I’ve been enjoying it. I’ve set up a routine for myself, based on things my physical therapist told me before I finished my sessions with her. I walk the track for one mile. Seven times around the track is a mile. I usually do four laps, then work on the machines then the other three laps. It’s not so boring that way. I do five minutes on the stationary bike. I plan on increasing that as I work at all of this and get stronger. For now, the five minutes feels good. Then I do a series of upper body and lower body machines. I have to say that I am Amazed at what I’m able to do while I’m there. I’m feeling very good about the whole thing. They gym also offers classes which you usually have to pay for, but they were offering a special that I could get free classes for the rest of the year. Then I’ll have to pay, but the good thing is that I get to try out the classes and know what I actually want to pay for after January. I think it’s a really good deal. I’m hoping to take the tai chi class. I have to miss it this week because of a doctor’s appointment, but next week, I’ll be there at 8:30 ready to go! ~There are So many things that are So much better now that I have had the surgery and I’m well on my way to recovery. Just regular day-to-day activities are better. Sitting down and standing up from a chair, getting in and out of the car, grocery shopping…Going To The Gym!! There is something that is really making me happy about this whole thing. Last year in the Summer and Fall, I was talking about all of the progress I was making with sorting out things that I wanted to be rid of. Things that I did not need for our move to New Mexico. I was accomplishing a Lot! 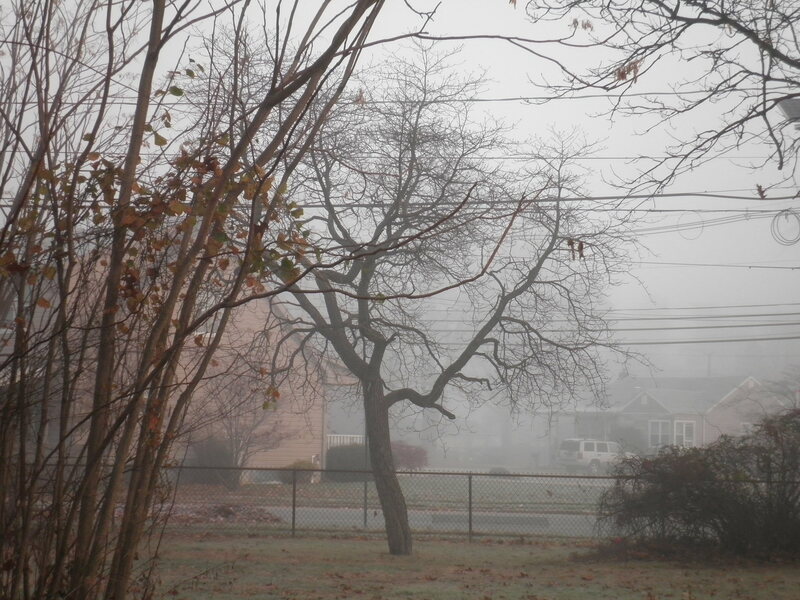 Then late Fall and Winter came along and I felt as if I’d aged 20 years. That’s all changed now and I’m back to work. I spent Sunday afternoon at my sister Ele’s house going through things I have stored there. 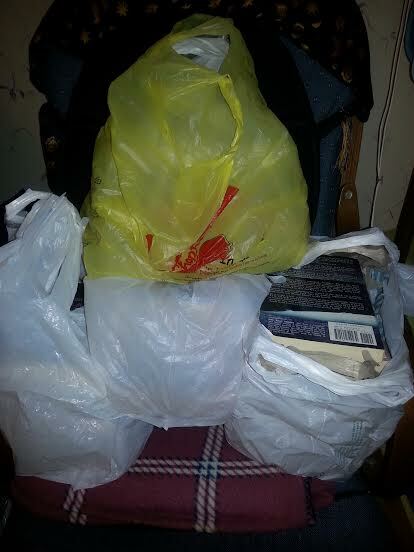 I filled one box of things to go to the thrift store and three bags of books to go to the town library. On Monday, I got to work here at home. I was proud of myself for being unsentimental about books and I’m happy for what you see in this photo. Four bags of books to go to the town library. They’re still sitting in my bedroom, but they’re ready to go. I’m glad to be contributing to the town library and I’m Very Glad that they will soon be Out Of My House! I’ve got so much to do regarding this clean out, but if I work on it a little a day, I know I can get it done. It’s crazy how you can pile things up, even when you try to stay on top of it. Believe me, when we get to New Mexico…this will NOT happen again. That’s Thinking Out Loud for me for this week. Makes me feel good to post an overall positive post. I like that! Be sure to stop over at Running With Spoons to see what they all have to say. Thinking Out Loud has become an important part of my week. I feel I’ve really found some like-minded “Thinkers” here. Created by Amanda at Running With Spoons, Thinking Out Loud gives us all a chance to get some things off our chests. Check out what other bloggers have on their minds (or off their chests!) when you’re finished here. I do wonder how it is that I have SO many things going on in my head throughout a given week, but when I sit down to write my Thinking Out Loud post, it all goes out of my head and I find myself sitting here going “uuhhhh” and “uummm.” Oh, well, as always, I still seem to be able to come up with something. Here goes. ~The news in the background just told me that Prince has just taken his first Selfie…should that be capitalized?!? Don’t know but anyway, he took it with an actual camera instead of a cell phone. He’s banned the use of cell phones around him. Quite a quirky character. Back to Selfies…I’m not good at them. I keep practicing but mercifully, no one sees them except me…Occasionally I’ll show one to Ralph. I keep practicing, though. One thing I don’t get about selfies, is why do people insist on posting selfies either making a duck face or with their tongues sticking out. Is that supposed to be alluring or enticing? I don’t get it. I’ll keep trying and I may post one but feel safe in the fact that there will be no tongues or duck faces. ~It’s been a good week in general. I’ve been getting to the gym several days and I plan to join this week. I’m pretty excited about the whole thing. Feeling so good is almost scary. I go for my last physical therapy session today (it’s actually Wednesday as I write this.) I’m glad and a little sad at the same time. I’ve truly enjoyed the physical therapy process. My therapist, Donna is wonderful and she seems to get my strange sense of humor. I’ll miss her. I will continue to be a good patient, doing my exercises at home and of course going to the gym will be a big help according to Donna. Thanks, Donna! ~I’m excited to say that I’m getting back on track with my sorting and packing projects. I was able to sort out 3 bags worth of Stuff that doesn’t need to be here anymore and take them to the thrift store. There is truth in the idea that if you work for just 15 minutes, you can accomplish a lot. I did that several times in the past week and I’m happy to say I feel I’ve accomplished things. I was feeling a little down about how much time I lost during my recuperation, but I decided that it was something I couldn’t take a chance with. I had to be totally up and around before I started getting into things again. I really feel like I’m on my way again. Now if I could only get Ralph on board with this clear out idea. We’d be a lot closer to moving to New Mexico if he would. But I’m not going to yammer about that right now. ~I’m trying to wrap my mind about the fact of the impending Holidays. Driving home from a coffee date with a friend on Monday night I saw a house all sparkly with Christmas lights. I was not happy to see that. I’m trying to make peace with the Holidays this year. I’ve had several very bad years regarding that and I’m planning on more Spirit and more Cheer. We’ll see how it goes. 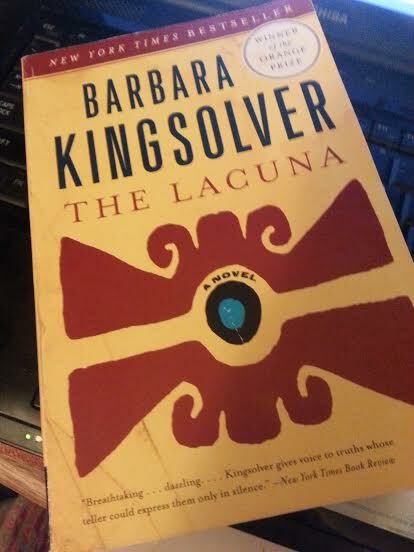 It took me a bit to get into The Lacuna by Barbara Kingsolver, but now I’m enjoying it. I try to read a little several times a day. It really is a calming thing for me. I’m glad that I’m getting back to one of my favorite pastimes. ~Heard some sad news this morning…Carol Ann Susi who was the voice of Mrs. Wolowitz on The Big Bang Theory has died. Even though you never got to see her on the show, she played an important part. That’s a shame. That’s it for Thinking Out Loud this week. Be sure to check out the other bloggers linking up at Running With Spoons. It’s always fun! It seems so easy to allow a Holiday like Thanksgiving to hang over for the next few days, sometimes the entire weekend. For many years prior to joining Weight Watchers, I allowed that to happen. Sometimes it continued into the next week or even several. I don’t allow that to happen to me anymore. Friday was a good day, under control and no sign of lingering excess flexibility. That is part of what I talked about last Tuesday when I talked about enjoying on the Holiday but then getting right back on track. I think I’ve done that at least so far. Friday I went to the movies to see Lincoln. It was incredible and I need to talk about it after I’ve digested it a bit. The key is that I ate Nothing at the movie. The smell of popcorn as we walked into the theatre almost got the better of me, but I just talked to myself in my head and made my way through it and let nothing get in my way. I’ll be curious to see what the scale holds for me when I get to Weight Watchers this morning. I’m really not sure, but I do know that I’ll be right back on program after the meeting and doing what I should be doing. I really do feel very much in control at the moment. What a nice feeling! 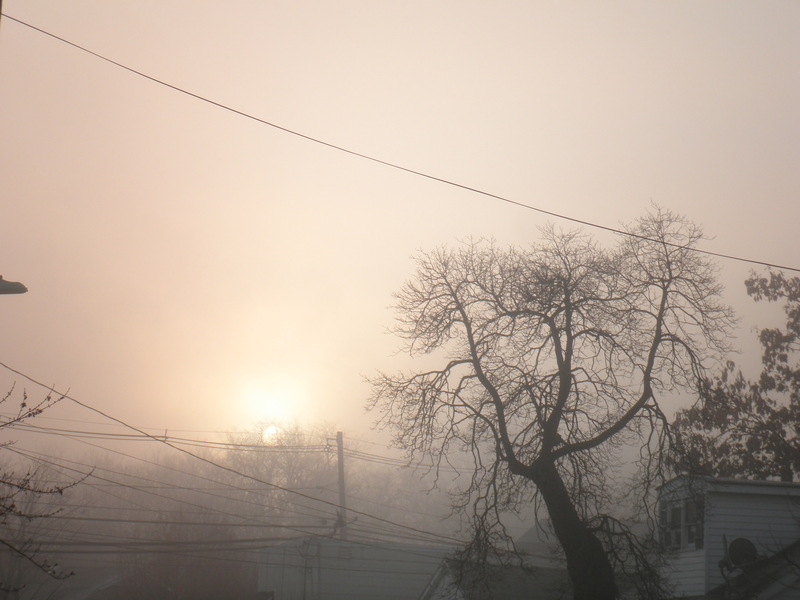 Friday morning when the sun came up there was a fog which led to some interesting pictures. Kind of spooky, but pretty. Happy Saturday!! Wish me luck!! Such a Clever Title! So seriously the lovely Jenn At Peas & Crayons, who hosts What I Ate Wednesday every week decided that she would host for two days and we could also play a second time and share What I Ate on Thanksgiving…I say Why Not! Here goes! My story actually starts on Wednesday. 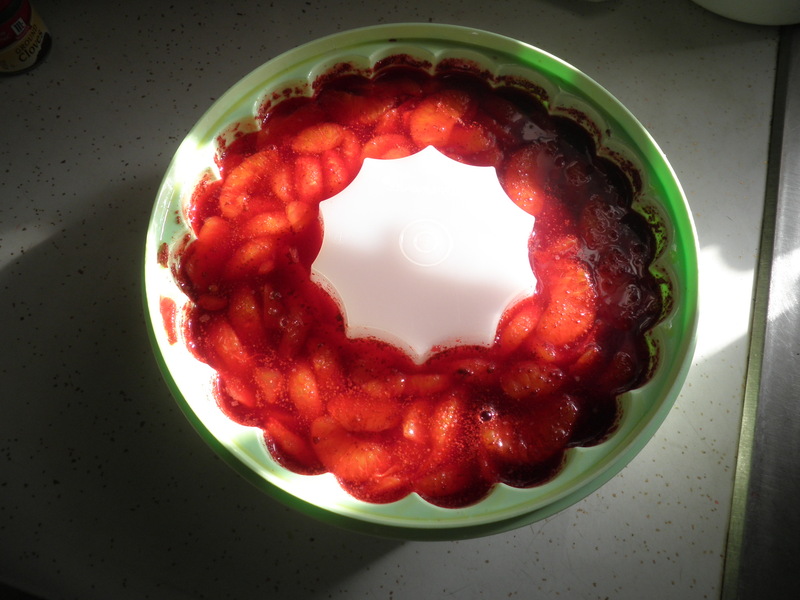 I had to create one of my usual contributions to Thanksgiving dinner…Cranberry Orange Mold. Here’s the story on the mold. 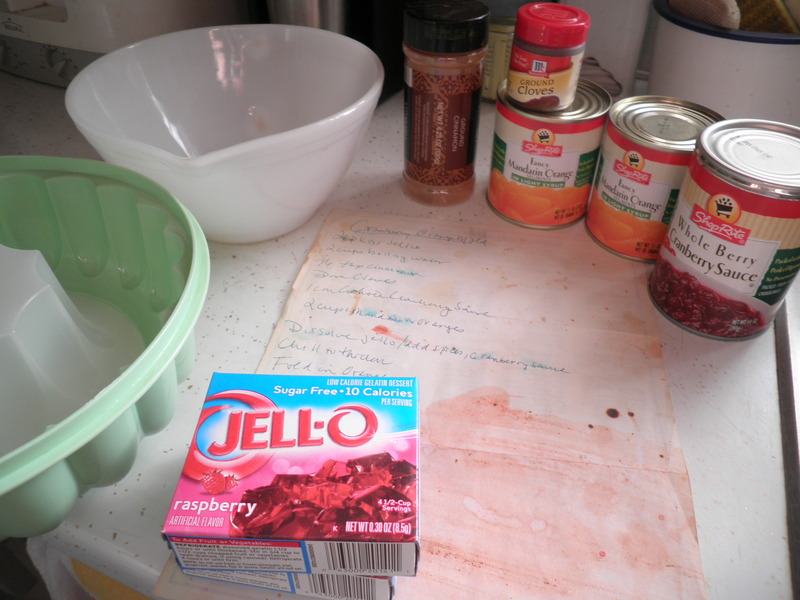 When I was a Tupperware Lady…MANY years ago (I left it to become a Weight Watchers leader) I got this recipe to go with the jello mold that we sold. Of course as is sort of like me, I never “officially” got the recipe…I got it by word of mouth. I’ve never been sure I have the recipe right, but after all these years of no complaints, I guess the recipe is right. The assemblage. Please take note of the recipe. This is the very same recipe that I wrote down on the fly all those years ago. 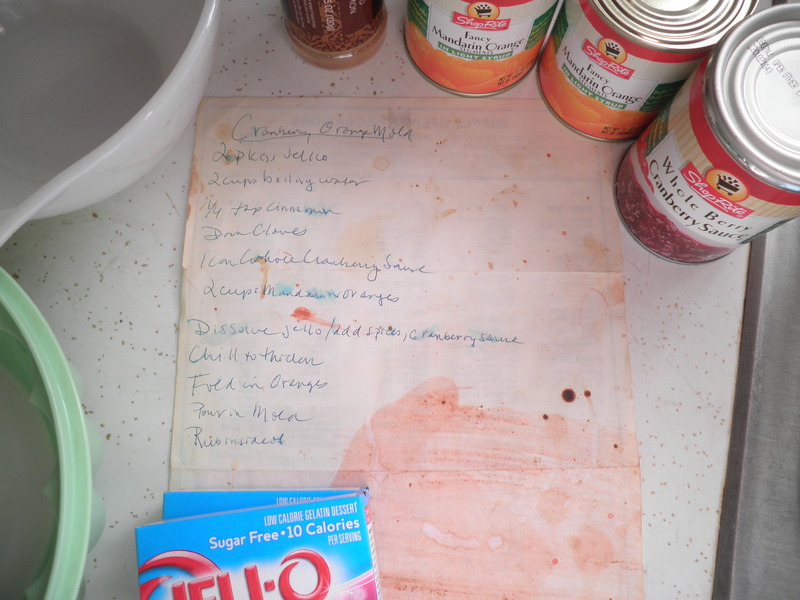 You can see that it’s old and as with so many of my recipes…stained. I’m working on putting everything in plastic sleeves to avoid this in the future! 😉 Here’s the recipe. Dissolve the Jello in the boiling water. 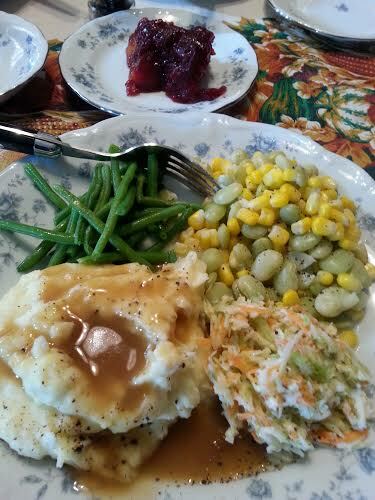 I suggest that at this point you add the whole cranberry sauce by spoonfuls. The heat of the water helps to dissolve it and it mixes in better. The amounts of the spices are really just general and depend on your own taste preferences. I add a lot more cinnamon and cloves, but that’s the way I like it. For your first try, you might want to follow the directions. Recipe says “chill to thicken.” I’ve never done that. When the cranberry sauce has dissolved into the mixture, I pour it into the mold. Less to pour makes it a little less messy…This is a learned action. Once the mixture is in the mold, add in the oranges. Stir carefully around the mold so that the whole cranberries and the oranges are evenly distributed throughout the mold. Chill overnight for best results. Be sure to let it sit out at room temperature before you try to unmold it. The process works better that way. I usually take it out about 45 minutes prior. The craziness as everyone starts to dig in before everyone is even seated!! 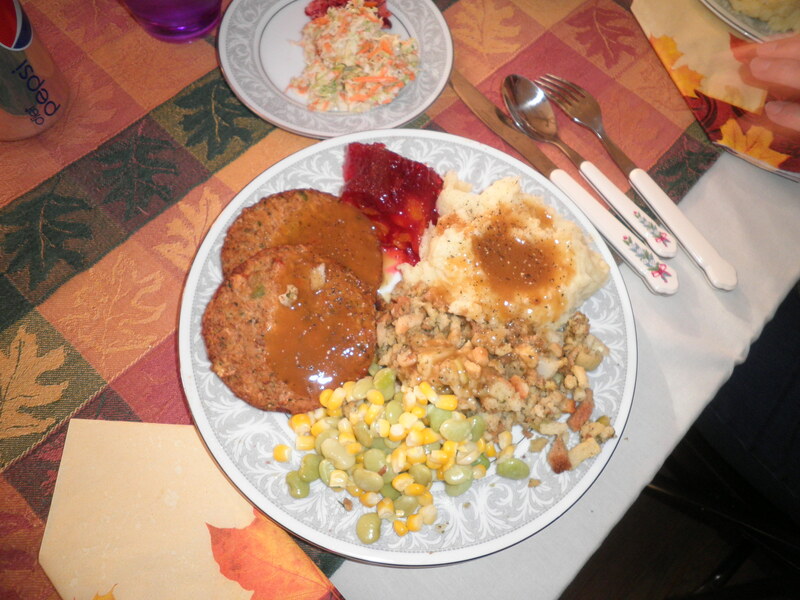 My heaping plate…Ele’s coleslaw and cranberry orange relish on my side plate. The star attraction two Morningstar Farms Grillers California Turk’y Burgers, mashed potatoes, stuffing, succotash (my favorite!!) 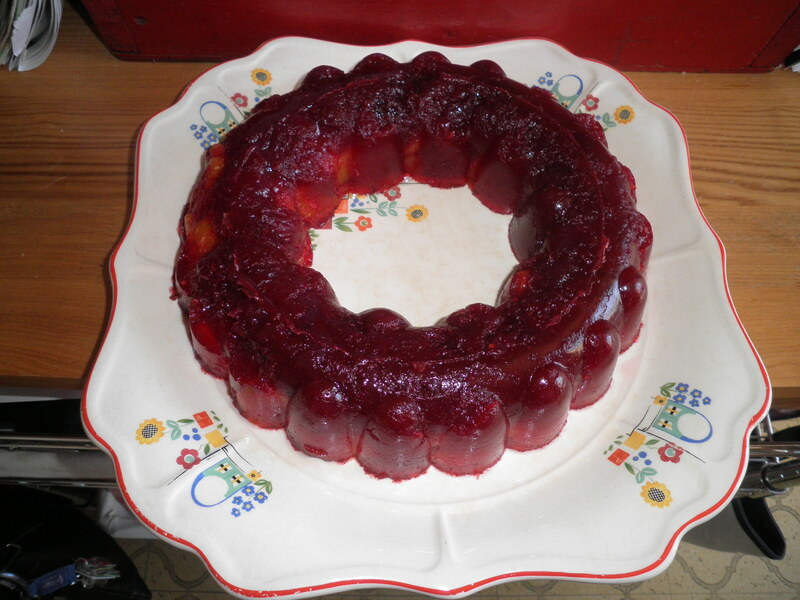 and cranberry orange mold. It’s vegetarian and I’ve been using it for years. 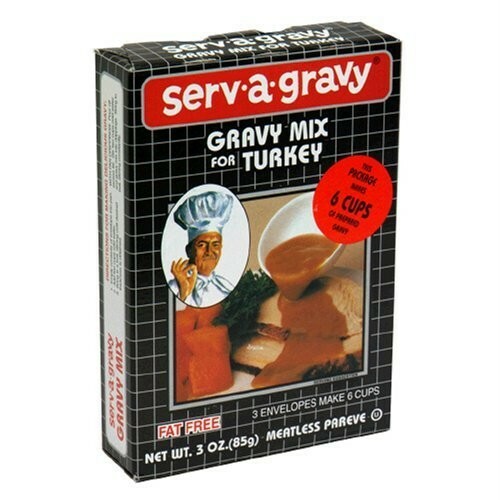 Quite a few years ago, we even stopped making “real” turkey gravy because no one knew the difference. With this, it’s perfect every time! 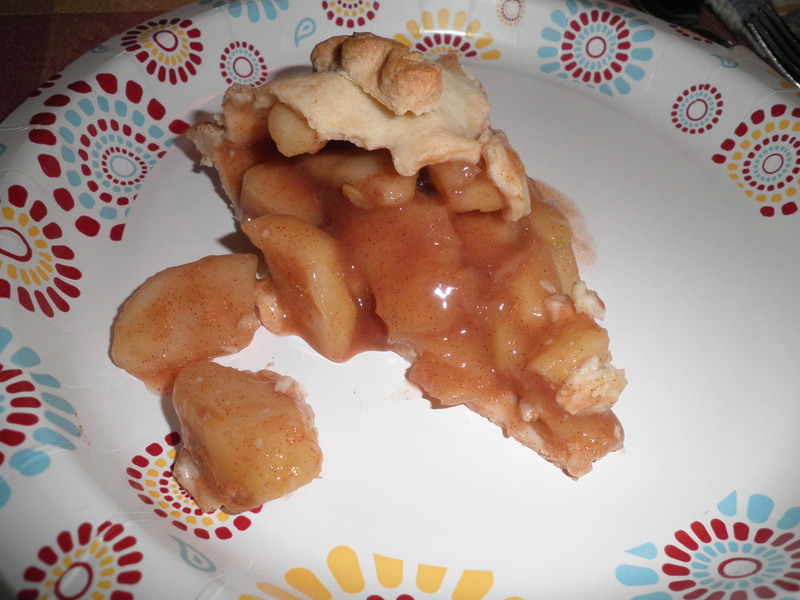 Apple pie all the way from Washington, D.C. courtesy of our friend, Jim! I must confess I also had a small piece cut from the square pan in the previous photo…pineapple cheese pie…a local favorite. Yum. Happy Friday after Thanksgiving!! I refuse to use that other name for it!